The Limited Edition RORC Caribbean 600 gear by Musto is available. This fantastic range of race gear includes UV technical and long sleeve tops for maximum skin coverage. The casual gear includes t-shirts, polos, jackets, shorts and hats for both men and women. 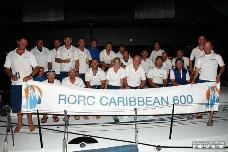 The t-shirts which are emblazoned with the 2019 RORC Caribbean 600 logo and course map. Stocks are going fast! You can buy online and pick up at the tent to ensure you don’t miss out on the style you want, or drop by between 9am – 6pm from Wednesday to Friday this week, or by Saturday morning the latest. Unisex Quick Dry Performance T - L/S Black. Purchase here.